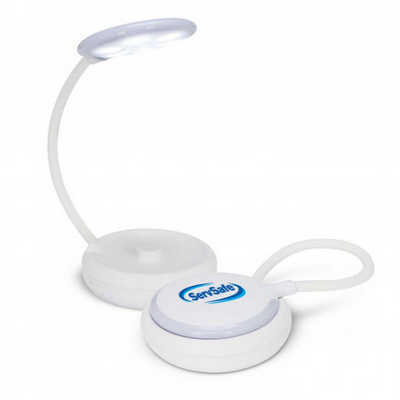 Compact personal multifunction lamp that folds away when not in use with the adjustable cable doubling as a handy loop for attaching it to a bag or hanging it up. Because of its portability it can used almost anywhere and is perfect for places where a good light source is not available. It has six powerful LEDs with two light intensity settings and it will also flash so it can be used as a safety or warning light. Avanza uses three AAA batteries which are included. Colours: White. Dimension: W 85mm x H 165mm (closed). Print Description: 45mm (circle). Print Type: Pad Print . Packing: Individual box. . Price includes : Printing Per Colour/Position. Setup is included.